I could eat at Linda's every day for the rest of my life and never get sick of it. Although I can't read any of the menu, I've liked everything that I have tried. Linda's is fairly expensive for Thai standards, but it's worth every baht. Thai people order food on dinner plates, then they each order rice, so they can share a bunch of dinner dishes. That's obviously not how it goes in America, we order just one dish and we end up with a huge portion of food for ourselves. We usually end up overeating, but the food is so good we're not even that mad. However, we recently learned that if you order a dish "la khao" it comes in a smaller portion for a fraction of the cost. What to order at Linda's: red curry with chicken, green curry with tofu, cashew chicken, or vegetables with shrimp. Each costs about 130 baht (~$4) for a large portion or 40 baht (~1) for a "lunch-size" portion with rice. Linda's pad thai is also one of the best in Pua (40 baht). Sam is the absolute man and owns one of our favorite restaurants in Pua. His restaurant is the only late-night place to get food (open 5pm until 5am). Sam speaks English very well, so we became regulars at Sam's when we were nervous farangs who didn't know how or what to order at restaurants. Sam knows what we like so many times we ask him to surprise us. What to order at Sam's: cashew chicken, fried rice, stir fried morning glory, or panang curry. Each costs between 40 and 70 baht ($1-2). Sam's also has the 2nd best french fries in Pua for 50 baht. Though Seeds is a drinking destination, it also has phenomenal food. Seeds has incredible service with the most fantastic, friendly staff. They have live music every night and the band always tries to throw a few English songs into the mix when the farangs show up. It's hard to drink just one beer here. What to order at Seeds: french fries, cashew chicken (it's good everywhere, apparently it's hard to mess up), fried rice, panang curry, fried pork, spicy basil with pork. Seeds hands down has the best french fries and fried rice in town. It's expensive here and when you order a few beers you'll end up paying 200-400 baht. We hit up Pua Cafe 2-3 times a week for lunch. They even came up with an English menu for us since we came so often. Their food is consistently great AND they serve good coffee and amazing Korean bingsu desserts. What to order at Pua Cafe: spicy basil with pork, pad thai, som tam (spicy papaya salad). Each is 30-40 baht, making it a super affordable lunch destination. 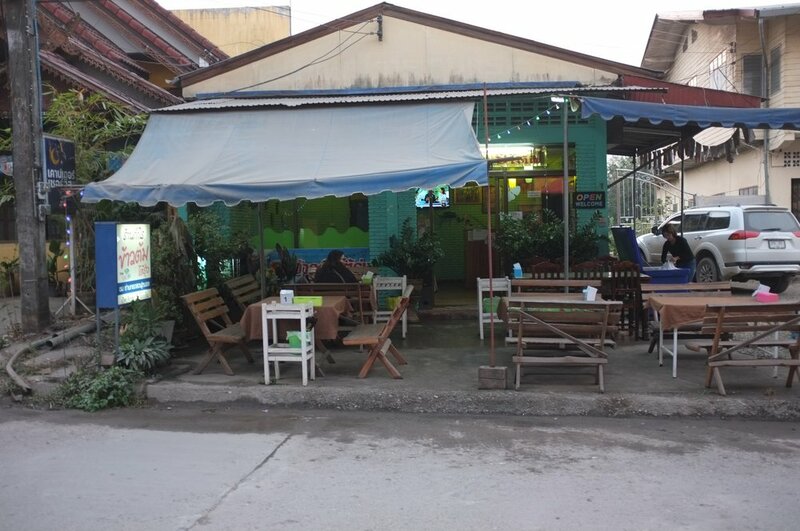 Not to be confused with Pua Cafe, Cafe de Pua has been one of our go-to places throughout our time teaching in Pua. The owners are an adorable couple that speak English very well. They're open until 10pm, which is about 4 hours later than most other places in this quiet town. I have spent countless hours at Cafe de Pua grading and writing lesson plans. I love their lattes and espressos, but they also have amazing dessert. What to order at Cafe de Pua: Salad with grilled chicken (120 baht)- this is the only place in all of Pua we have found to serve salad. Any other place that claims to serve "salad" gives you three pieces of lettuce smothered in mayonnaise. Also, their banana crepe roll-up and honey toast are to die for!! Honey toast is half a loaf of bread cut up, toasted, smothered in butter and honey, with a scoop of vanilla ice cream, fruit and whipped cream.